Friday, May 25, 2012, 6 p.m.
Mamoru Okuno's artistic practice crosses over sound/music and visual art. He looks into the simple gestures and the complex social condition of the everyday life at the same time, and brings out the "beauty" of the sound that derives from there. His work, "etude for everyday life," highlights and incorporates everyday objects and practices in a way that generates intimate listening experiences. Ordinary objects (plastic straws, food wrap, ice, steel hangers, instant noodles, etc) are employed to make the sound, while everyday practices such as purchasing products and eating food are integrated into his process of creating the work. 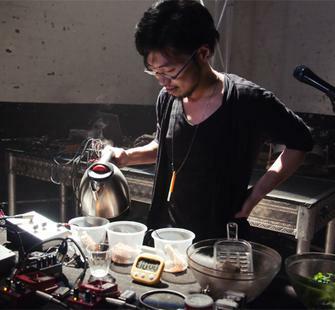 Okuno's Final Fridays event will include video works and a live presentation of some other "etude" works, which will give the audience some understanding about how he approaches daily products or actions to transform them into sounds and experience.